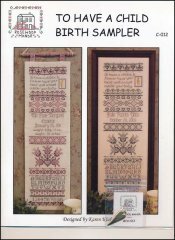 To Have A Child Birth Sampler [C5733] - $18.00 : Yarn Tree, Your wholesale source for cross stitch supplies. A birth sampler. The verse “To have a child is to forever have your heart walk around outside your body” was the inspiration for this piece. Stitch count 86 x 288.